Glorious weather in front of the famous mountain Zahmer Kaiser. Just minutes before the start the fog over the lake cleared and the sun made the lake appear in all its beauty. At 09:00 am the professional athletes started their competition. Former German competitive swimmer Florian Angert came with a small lead into the first transition area. Approximately 50 seconds behind him a small group with the favorites Giulio Molinari from Italy and Briton David Mcnamee. Also in the leading group Austrian Luis Knabl. On the bike Molinari quickly headed to the front. After 25 kilometers, he took the lead from Angert. Just two minutes behind Thomas Steger. Through kilometer 60 no changes in the field. As in the past years Molinari puts the hammer on the bike with more than one minute in the lead. Behind him Germand Florian Angert and another two minutes back Thomas Steger. After 2:28:56 hours Molinari finished the bike course as leader and went on his final half-marathon. 90 seconds behind Molinari Angert went on the run course. As best Austrian on rank three Thomas Steger starts his run. After the first round it seems to become an exciting duel for rank two. Steger took already more than a minute on the first lap but has to serve a 30-second time penalty because he abridging the path in the transition area. After the third lap Thomas Steger sit out his penalty, after the close to gap to Angert to 20 seconds. Molinari took this years European Championship title with a lead of one minute on Florian Angert. Rank three took Thomas Steger. Molinari: "A dream. 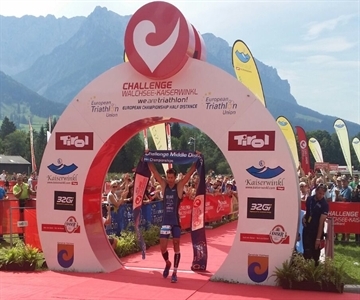 Last year in Italy, I was not able to win, but I wanted to win this title in Walchsee. All good things come in threes! The Challenge Walchsee-Kaiserwinkl is an awesome race. I look forward every year to this competition ". Florian Angert cannot find the right words for his success "crazy and if someone would have told me this today in the morning, I would have laughed at him. It feels very surreal to me." "For me, the third place feels like a victory. After my penalty, it was a struggle. Iam really happy about the third place." Thomas Steger after he crosses the finish line. The ladies startet five minutes behind the men at 09:05 am. As the first athlete the Italian Margie Santa Maria run out of the water. Just a few seconds behind her the German Julia Gaier, who took the lead on the bike after six kilometers. Behind Gaier, Kim Morrison and Lisa Hütthaler pushed really hard to catch Gaier but could not close the gap. After 60 kilometers the gap between Gaier and Hütthaler was about two minutes. Kim Morisson was another two minutes behind Hütthaler. Gaier lead the field into the second transition are. Her lead was more than four minutes in head of Lisa Hütthaler and another two minutes ahead of Maja Stage-Nielsen from Denmark. After about 10 kilometers Stage-Nielson overtook Lisa Hütthaler. Julia Gaier was unbeatable today and took her second European Championship title. Behind Geier Stage Nielson took the second place in front of Lisa Hütthaler.